This was our first 15mm Napoleonic game using AoE. Paul B, Mark and myself (Thoran) have been building 15mm armies using Old Glory, Minifigs and AB miniatures. Mark has painted a large French army together with a few Prussian and Russian brigades and batteries. Paul has painted a goodly number of Prussians and I have have a few Russian infantry and cavalry brigades and a number of batteries. 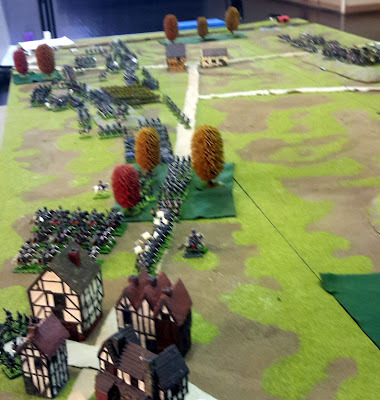 A battlefield was set up and we deployed our forces and had at it, with Michael and Mark as the French and Thoran and Paul as Russo-Prussian. In the end the Allies gave it as a French Victory. One Russian Dragoon brigade did give the French infantry and artillery on the French Left Centre a lot of trouble but it was not enough, the French had the overall upper hand. this calls for a re-match in the new year.